To increase quality, reliability, safety and security of Railway systems while increasing accessibility and productivity, modern railway operations rely on ever increasing exchanges of information between the different stakeholders. 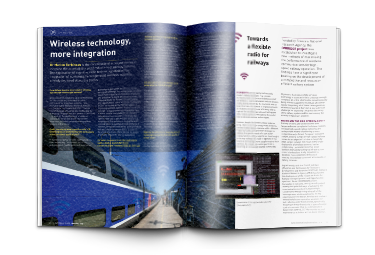 The integration of all the heterogeneous wireless networks deployed in the railway domain constitutes a key technical challenge. This can be answered by emerging Cognitive Radio (CR) technologies which can offer interoperability, robustness, reliability, spectral efficiency, and lower deployment and maintenance costs. The ANR CORRIDOR project, labeled by 3 competitiveness clusters (i-Trans, System@tic, i&r) will design, develop and evaluate the bricks of a Cognitive Radio system adapted to high speed railway to solve the problem of interoperability and costly deployment of incompatible wireless systems along the railway lines and to contribute to spectrum efficiency and global cost reduction. CORRIDOR is the first project devoted to CR systems for Railway applications in France, taking into account three specific applications: GSM-R, CCTV and Internet on board. A key target of CORRIDOR is to validate cutting-edge opportunistic air interface technologies allowing for robust low-latency links between high-speed trains and ground infrastructure to support of the above applications. Emerging techniques such as carrier aggregation to exploit TV white-spaces, dynamic interference management and opportunistic spectrum use, cross layer and handover optimization will be developed and validated with the OpenAirInterface. The originality of the CORRIDOR project relies on three main points. Firstly, the design and evaluation of the different technological bricks will be performed taking into account real data (channel, signals and noises) acquired at the beginning of the project thanks to preliminary trials along the TGV east line and the system evaluation on chosen scenarios that will be conducted at high speed (320 km/h). Secondly, the platform integration of the different outputs of the technical tasks will be performed using a common simulation and implementation environment (OpenAir Interface) well known in the CR community and shared by all the partners. Thirdly, the collaborative approach between the Intelligent Mobile Terminal and the Intelligent Telecommunication Infrastructure can also be highlighted as a part of the project novelty.